Do you believe your voice is incredible and give a special attraction to the people? If yes then why not earn money from each special word come out from your mouth. Yes you can make money online using your voice!!! But how? Well, from TV channel to movies, advertisement to announcement everywhere one expert always needed and that expert called voice over which provide voice to each such programs. Like suppose I take an example of one movie “The jungle Book” so each voice of this movie whether it is monkey voice or any other given by human being only and this art called Voice over. So if you also have such type of talent to give voice of any actors, animal or any other cartoon characters then you can use this talent and start earning. You can check top voice over salaried paid and choose your career in this field even . Voice over is work for those person who like to get pay for their passion. They love performing and also want to do it for a living. So here I am giving you few special website that work particularly for voice over freelancing where you can take chance to start your career as freelancer. This is best voice over Platform that connects businesses associates with professional voice talent. 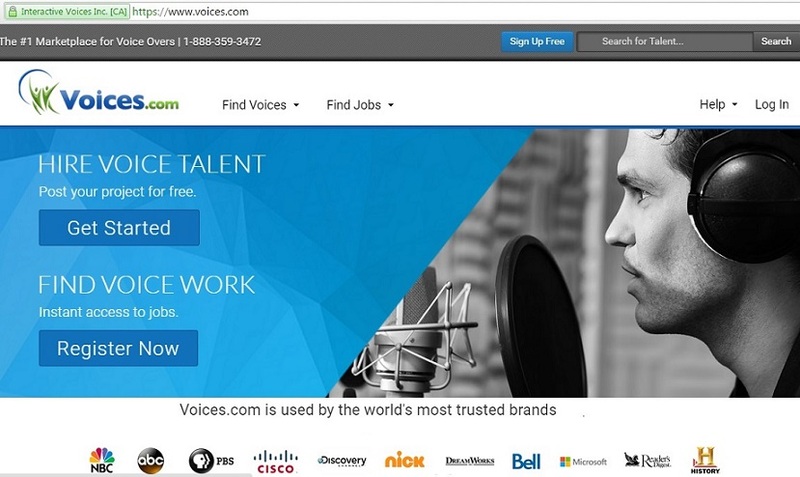 Many companies need voice talent for their radio channel, Ad promotion, some industrial purpose or narration of story so they use this portal to find talent. Here you can join without paying single penny and start making money. 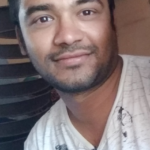 As this platform work world wide so you can use any language even regional language like you are Indian and know Gujarati or Tamil language then also you will get voice over job. If you have cartoon voice or some special voice then chance to hire you is much more. as many people searching voice that suit to their character so keep visit here and update your voice sample regularly. In order to start here you just need to upload mp3 audio of your voice then client listen and contact you within 24 hours . Payment method– Paypal or cheque. Just provide demo of your voice, detail about your experience, Native language and get voice over job from all over then world. Website select voices based on experience, audio quality, and ability to follow direction. If you offer the best quality then chance of getting more work and more chance of earning. You will get variety of projects, lots of auditions and huge number of client to get success in voice over career. This platform is very easy to navigate and self explanatory. You will also find their quick customer service. Voice123 provide platform to buyer to views your profile and listen your demo audio then contact you directly. Website also provide them talents to audition . 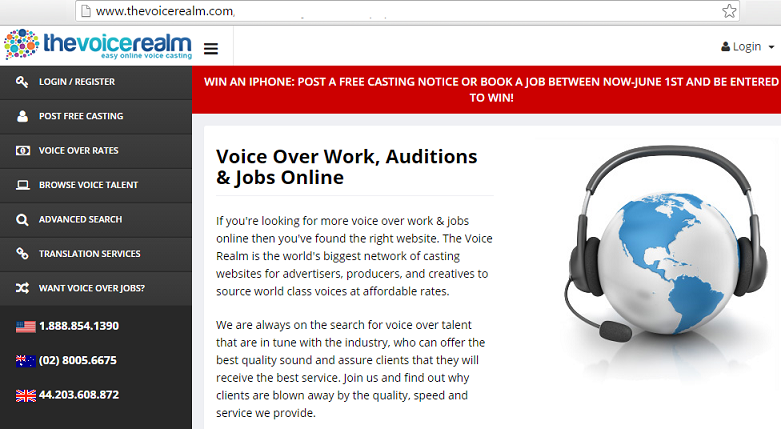 You will easily get voice over job on this website as more than 1500 project posted every month and you can give audition for each project. Amount you get is depend on project you choose like I saw one project where you need to give voice for just 40 second and you can make $100. You can register here free of cost. You need to upgrade to premium membership with amount $395 annual fee. Website does not take any commission or royalty. 30 days if not get work then 100% money back guarantee. Best platform to get voice over job for any language you know. This platform have client who required voice for different languages. 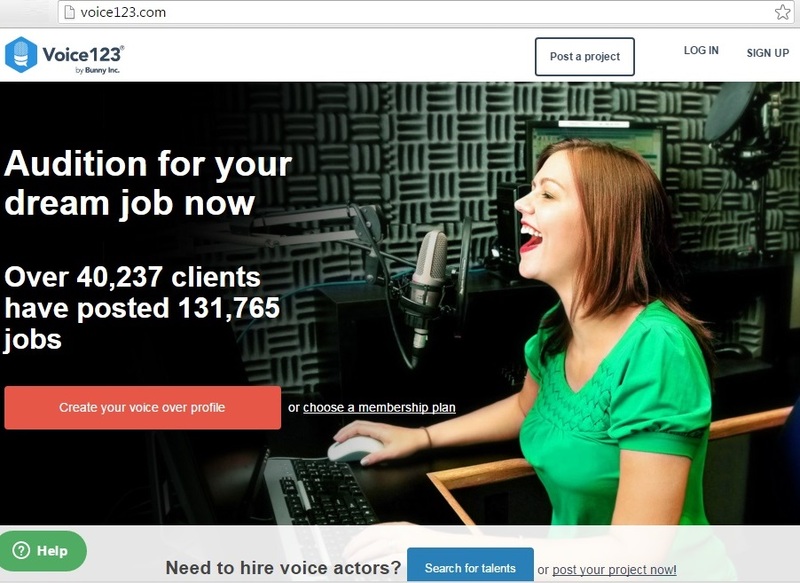 It offer 2 kind accounts for voice talents. On signing up you will be granted a free basic membership and in premium membership it offer three attractive plans (monthly, half-yearly, yearly). Once you register then client choose you to do specific task and payment discussion also happen between you and client, Bodalgo work just as platform for service exchange. You need to give audition for the jobs and you will get notify via email from client when you get selected for any project. Even if you have any question then you can check frequently ask question of Bodalgo. You will get mail when client choose you and connect you directly. 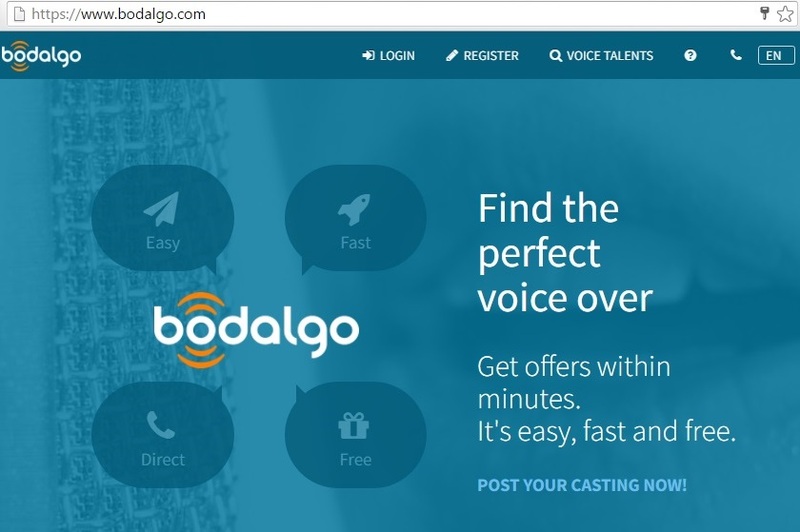 Bodalgo not charge any fee or commission on voice over service. You need to pay for additional service like bodalgocall means you need to update if you want to use. Founded by an artist that make this company Best place of experience and professional voice over actor. Here you will get paid for 2 ways either you set your own rate and Upload sample of your work so once client book you or you can select client submitted project and submit your voice over. you won’t have to pay for application, subscription, or commission fees. 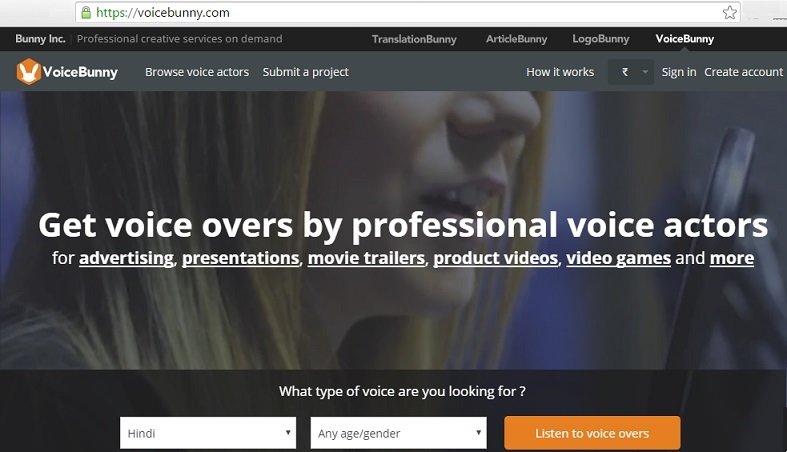 You voice will be use for advertising, presentations, movie trailers, product videos, video games and many more..You will get voice over work irrespective of your country and language. All work is screened for quality . Some time pay you for every voice over you create and system approve. Acceptance ratio is low it’s 1 in 10 so give your best. As per their website they choose 2% of all the professionals that apply. Here some more sites which pay you for voice over work but this sites are general and not work only for voice over. So just search your appropriate work then start bidding and earn money. Hope you like this post and now able to apply for voice over jobs over many platform. Please be active on profile to get work fast.